The crowd was going to be fairly small. The gates were going to open two and a half hours early. The configuration of the left field seats was going to be ideal. And in my previous four games at this stadium (two in 1999 and two in 2000), I’d averaged 9.5 balls per game. I wasn’t merely hoping to have a big day. I was expecting it. But first, I had some exploring to do outside the stadium. That big area is called Monument Grove. In case you can’t read it, the words on top say, “THE LONGEST CONTINUOUSLY OPERATING FRANCHISE IN MAJOR LEAGUE BASEBALL.” (I was not aware of that fact.) Underneath it, there were years and logos and names of all the Braves’ former cities and teams: Boston Red Stockings (starting in 1871), Boston Red Caps, Boston Beaneaters, Boston Doves, Boston Rustlers, Boston Braves, Boston Bees, Boston Braves (again), Milwaukee Braves, and finally the current Atlanta Braves. It wasn’t nearly as snazzy as any of the Twins shrines that I saw on May 4th at Target Field, but it was still cool to see the Braves honoring their past. Meh. Nothing wrong with it, but not particularly memorable. Fulton County was the home of the Braves from 1966-1996. I was there for one game in 1992 and snagged one ball. It was thrown by a (now totally obscure) player on the Padres named Guillermo Velasquez. I remember it well. It was rainy. There wasn’t BP. I was in the left field corner with my family. I didn’t have a Padres cap. I was 15 years old at the time. And…what else can I say? The whole thing was lucky and feels like it happened in a previous life. It’s the spot where Hank Aaron’s 715th career home run landed. (At the time, Babe Ruth held the record with 714, so this was a big big big big BIG big big deal. And of course it was more than just the numbers. There was the whole issue of race, too. Big deal. Very big.) Very cool to be standing so close to where such a major piece of history went down. Even more important, perhaps, was the fact that the seats extended all the way from the foul pole to the batter’s eye. In other words, I was going to be able to position myself in all sorts of different spots based on who was batting and where the crowd was clustered. The batters basically have to hit the ball 400 feet just to reach the seats, and because the front row is always crowded, you’re talking 410 to 420 in order for them to reach a spot where you’ll have some room to run. I ran back to left field and snagged a ground-rule double that bounced into the seats near the foul pole. I was proud of myself for this one because the ball had been hit really high, and I was all the way over in straight-away left field. I knew that it wasn’t going to clear the wall on the fly, but instead of giving up on it, I kept running in case it bounced over. Two years ago, I wouldn’t have made that play. I wasn’t as good at judging fly balls, and didn’t have The Vision. I don’t know what’s happening, but my instincts are suddenly improving. I can feel it. It’s awesome. I ran all the way to the seats in straight-away right field (it takes an effort to get there; the path is anything but direct) and caught a home run hit by Melky Cabrera. I had to move a full section to my right for it, and when I looked back up for the ball, I found myself staring right into the sun — so I felt good about that snag as well. It’s still possible to use the glove trick there, but balls don’t drop down too often. When the Braves finished their portion of BP, I raced over to the seats behind their dugout — and was told by various ushers that I wasn’t allowed down there. Seriously, what kind of Citi-esque nonsense was that? Braves hitting coach Terry Pendleton was throwing ball after ball into the crowd, and since I was already halfway down into the seats, I started yelling to get his attention. He threw a ball to a nearby female usher, presumably for me, and when she dropped it and it started rolling toward me, she yelled at me to get away from her ball. Then, after she “ran” over and grabbed it, Pendleton threw her another, which she kept. “Are you kidding me? !” I yelled. “Theesa fo’ my keeeids!” she insisted. That IS, in fact, what was happening. As this usher was guiding me up the steps, however, I managed to get Pendleton’s attention, and he threw me my seventh ball of the day (which I caught right in front of her face). Unbelievable. Does anyone have Ted Turner’s phone number? I need to have a word with him. When the Mets took the field, I was once again prohibited from entering the seats behind their dugout — or even next to their dugout. The closest I could get was shallow left field! I got a ball tossed to me in the left field corner by one of the trainer-type-strength-and-conditioning-coach dudes. Then I moved to straight-away left and fished a home run ball out of the gap. (That was my ninth ball of the day, and there was some competition from other fans with devices.) Less than a minute later, I caught a homer on the fly. I’m not sure who hit it. All I can tell you is that I was in the third row, and there was a guy around my age in the second row. When the ball went up, he misjudged it and moved back. This enabled me to carefully slip past him and drift down to the front row, where I leaned over the railing and made the catch. It was a Citi Field commemorative ball. I’d snagged a bunch of these last year, but it was still great to get another. Commemorative balls are sacred to me — even the ones like this with poorly designed logos. …but that didn’t stop me. I snagged a David Wright homer that landed near me in the seats and then ran over to right field for the next group of hitters. It was either Jose Reyes or Luis Castillo — I just wasn’t paying close enough attention — but whoever it was hit a home run right to me. I mean right to me. I could sense that someone was running toward me in the row below me, so I reached up with two hands to brace for a potential collision. The ball cleared this other guy’s glove by three inches, and then he tripped and fell headfirst over his row. (Yes, I caught the ball.) Don’t feel bad for him. He was in his 20s and looked/acted like he belonged in the mosh pit at a punk rock show. Thirty seconds later, I saw him scramble for another ball and grab it right in front of a little kid, who looked pretty devastated. The kid’s father tried to plead with the guy to turn the ball over, and when he refused, I tapped the kid on the shoulder and handed him the one I’d just caught. The kid (as you might imagine) was thrilled, his father thanked me for a solid minute, and I got a bunch of high-fives from other fans. Back in left field, I went on a mini-snagging rampage during the closing minutes of BP. Pedro Feliciano threw me my 13th ball of the day. Then I used my glove trick (No. 14). Then I grabbed a home run in the seats that some grown-ups bobbled (No. 15). And then used my trick again for a home run ball that landed in the gap (No. 16). I managed to get down to the Mets’ dugout at the end of BP, and as all the players and coaches were clearing the field, I got Howard Johnson to toss me No. 17. Yunel Escobar grounded out to Mets first baseman Ike Davis to end the second inning. Davis jogged in and tossed me the ball. Pretty simple. The ball, it should be noted, had the Citi Field commemorative logo on it, which means it wasn’t the actual ball that had been used during the game; Davis had obviously kept the gamer and tossed me his infield warm-up ball instead. As I jogged up the steps, I happened to see Kevin Burkhardt, the Mets’ sideline reporter, sitting at the back of the section with his SNY microphone. I had gotten to know him a bit over the past few seasons, and once I started snagging baseballs for charity last year, I’d been asking him if he’d interview me about it someday. Long story short: the interview finally took place last night during the bottom of the 4th inning. Here’s another screen shot (courtesy of my friend Howie) during the interview itself. Yes, Howie actually photographed his TV. 1) How do you catch so many baseballs? 2) Can you tell me what you’re doing for charity? I still have yet to see a tape of it, but according to Howie, when Eric Hinske homered the following inning (to a spot where I wouldn’t have been anyway), the Mets announcers mentioned me. There’s a cross-aisle that runs through the entire field level, so it’s easy to run left and right. The only problem is that the protective screen is rather tall, so balls have to loop back over it — something that doesn’t happen too often. 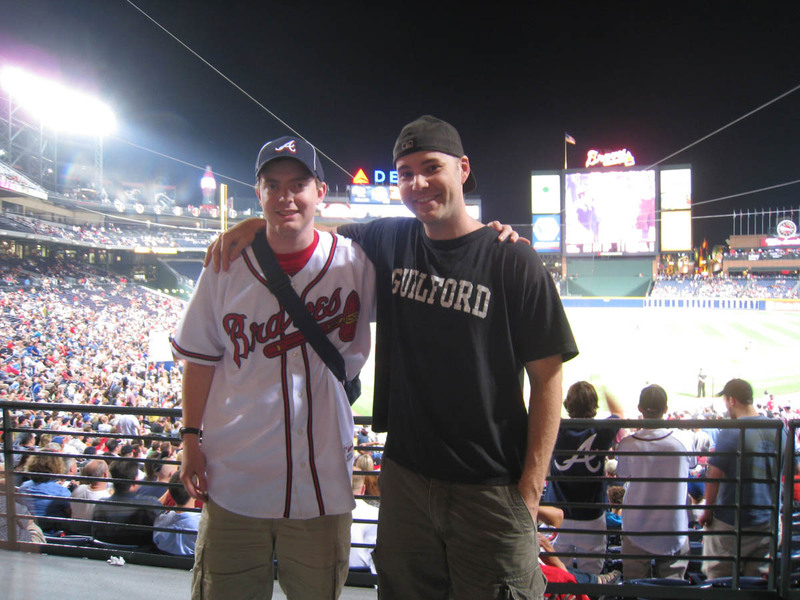 Matt had kindly given me some pointers about Turner Field in recent weeks. I returned the favor last night by signing his copy of Watching Baseball Smarter. 1) Go to the Mets’ dugout. 2) Get a ball from home plate umpire Ed Rapuano. 3) Get another ball from the Mets as they walk off the field. 4) If that fails, get a ball from the relievers when they walk in from the bullpen. Good plan, right? It gave me three chances to snag two balls. Well, Rapuano took care of the first one, but then the Mets let me down. None of them tossed a ball into the crowd as they headed back in — and get this: the relievers never walked across the field. They must’ve headed from the bullpen to the clubhouse through the underground concourse. My day ended with 19 balls. The Mets held on for a 3-2 win, so my Ballhawk Winning Percentage improved to what would be a major league best: .792 (9.5 wins and 2.5 losses). • 119 balls in 12 games this season = 9.9 balls per game. Yeah, I took a picture of my crappy 12 inch tv that is a decade old that still has a vcr in it. Thanks for including me in this entry. Hey, Zack! I’m SO bummed that I missed the interview. 19 balls?! Holy mother of God. Good job. Maybe you’ll break your 32 ball record today. Reach for the stars, Dude! Nice game Zack. I’m so mad that I wasn’t able to see your interview last night. Despite being a Yankee fan, I usually watch the Mets games instead because of fantasy baseball (the yankee games are usually blowouts anyway, lol). Good luck the rest of the trip. Don’t feel bad for him. He was in his 20s and looked like he belonged at a punk rock show. Zack, Check out the bullpens after the game, Eddie Perez always tosses up 2 or three after the last out. Just a note on Turner Field, the large pillars surrounding Monument Grove right off Georgia Avenue were the pillars for the original stands of Centennial Olympic Stadium for the 1996 Olympiad. They also mentioned you later in the game when a slow foul ball rolled into the wall besides the mets dugout. they said something about “zack and his parents” but I don’t remember what. Pete and Zack, good to see you both at this game. Also glad to see you’ve had success so far on this trip. I haven’t had a chance to do any snagging this season, but plan to over the summer. Gotta get off my lowly total of 57 lol. I hope you can do well at the game against Cincinnati, since the outfield will have a bigger crowd. I saw you out there today, in which the Braves won 3-2. You were running all over the place!!!! I have been to 4 Braves games this year so far and have caught a total of 31 balls. Are you staying for the Cincinnati series? I might head out there on Thursday. HAHAHA.Great day Zack. When I was reading this entry I was more concentrating on pics rather than text. So when I saw photo 17(the leg caught my eye :) ) I was almost 100% sure that you’ll write about a ball being somewhere near. Congrats on the game and I’m waiting for more entries. To continue about Photo 17. We can create a test: “Are you a real ballhawk?”. My father called me from PA and when I answered he was laughing. He was watching the Mets game on SNY and called to tell me you were being interviewed. He got a real kick out of the fact that you had 18 balls. Thanks for making him laugh, dude. Hope to see you soon. Hey Zack, it was great to meet you on Tuesday night, and again last night. I was the girl with the red backback. The Braves fan from NJ. It was really nice meeting you and getting to talk to you. I’ve been ignoring work all morning and reading your blog. Baseball will one day ruin my life, lol. Anyways. I am LOVING what I am reading. Thanks so much for being friendly to me, chatting with me, and for writing such great stuff. I will def be reading your books soon. Thanks! Hope you enjoyed Atlanta! You seem like a genuinely nice guy, but the part involving the usher … really? How dare that woman think of taking a couple balls for her kids! Doesn’t she know they’d be much better used sitting in a drum in your childhood bedroom? 32 balls?! Maybe if there were only 5,000 fans there. That’s not a record that I ever expect to break. And…thanks for looking out for me. Sorry, didn’t mean to offend. I edited that line in the blog to give a better indication of what was going on. I have nothing against the punk look. I love it, in fact, and I also have some punk music on my iPod. I was just trying to indicate that the guy looked really out of place — and that he acted out of place, too. Thanks for the tip. As it turned out, though, I was never near the ‘pens after the game. I just played the dugouts. Well, sure enough, I had my lowest total at the Reds game, but I think that was actually more of a reflection of the Reds not throwing much into the crowd, rather than the size of the crowd itself. Sorry I didn’t get to answer you sooner. I only stayed for the first Reds game (on May 19th). You know what’s funny? I didn’t even notice the leg until I got back to my hotel and started going through the pics. I like the test idea. Well…you’re welcome. Hope to see you, too. Great meeting you, too, and thanks for leaving a comment! Thanks also for all the insights about the Braves, especially about that certain player’s wife. Heh. That usher has worked behind the dugout for the last 14 years. Do you really think she’s never gotten a baseball before? Please. Anyway, as a general rule throughout MLB, stadium employees are NOT allowed to keep baseballs. The fact that I have thousands of them has nothing to do with it. What if I had none and I was trying to get one for MY kids? What gate opens first at Turner Field . Im going with my dad to see the braves play the phillies .?? I just answered you on my “glove trick” entry because I saw your question there first . . .